The four pages shown above were received a number of years ago, without comment, from a Tarawa veteran who is a former president of the 2nd Amphibious Tractor Battalion Association. The notes in the left margins of pages 2 and 3 were part of the photocopied pages, and had not been added after the photocopies were made. 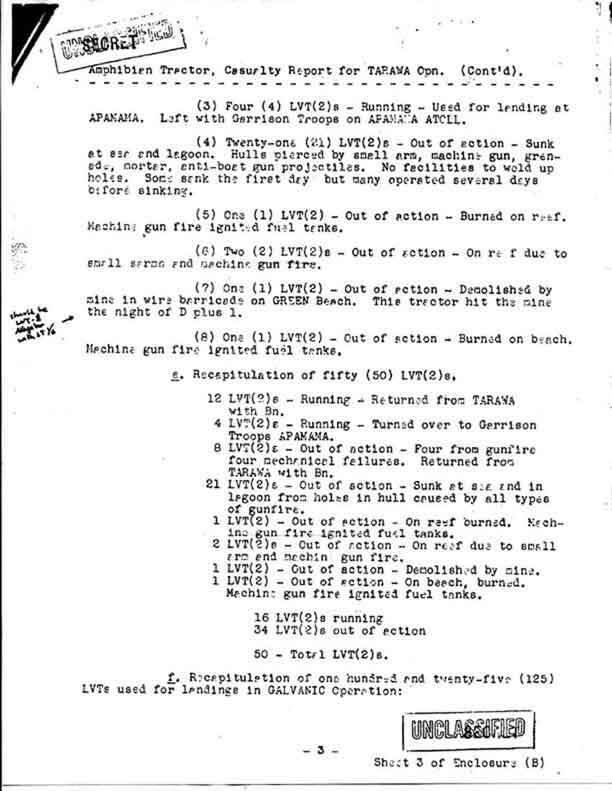 The author of the notes is not known, but they are obviously someone's attempt to correct the obvious errors concerning the two LVTs that were "Demolished by mines in barricade on GREEN Beach." QUESTION MARK ON PAGE TWO: The margin note is a question mark. "One LVT(1) -- Out of Action -- Demolished by mine in wire barracade on GREEN Beach. This tractor hit the mine the night of D-day." It is an indisputable fact that an LVT(1) from the USS Feland hit a mine off Green Beach, just as darkness was falling on the evening of 21 NOV 1943, which was D+1, not D-day. 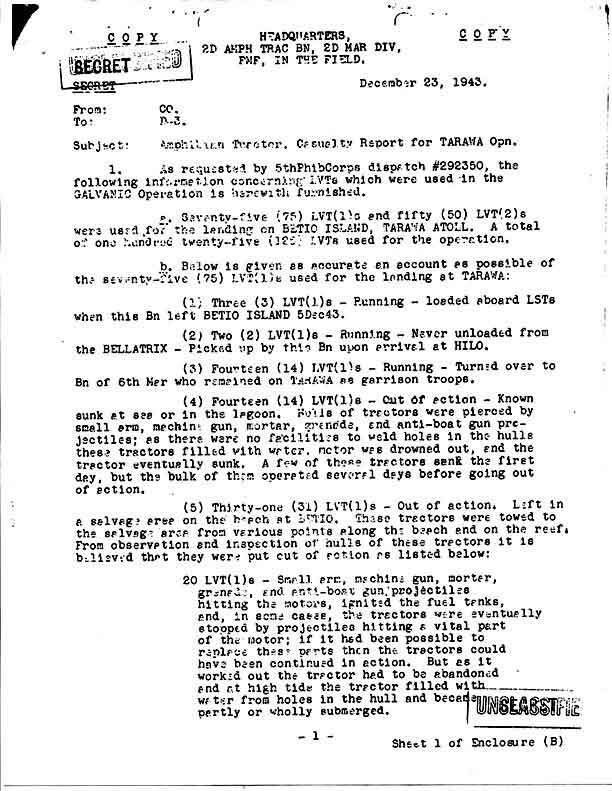 The report goes on to indicate, in several places, that only one LVT(1) hit a mine. If that is true, then it had to have been the LVT(1) from the USS Feland. 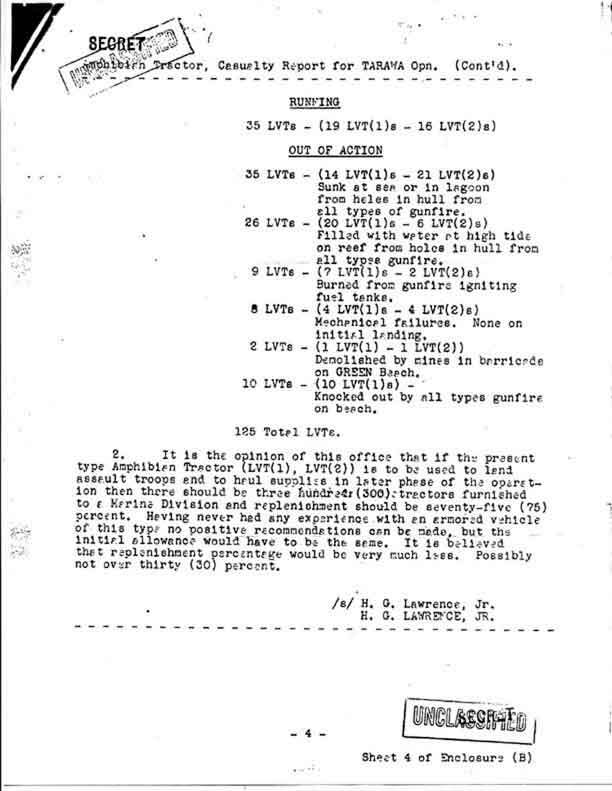 MARGIN NOTE ON PAGE 3: The margin note reads: "Should be LVT-2 (Changed to LVT-1) Alligator with LT 1/6." "One LVT(2) -- Out of Action -- Demolished by mine in wire barracade on GREEN Beach. This tractor hit the mine the night of D plus 1." The question then becomes: What is the note-writer trying to say? That only one LVT(1) hit a mine, and that no LVT(2) hit a mine? 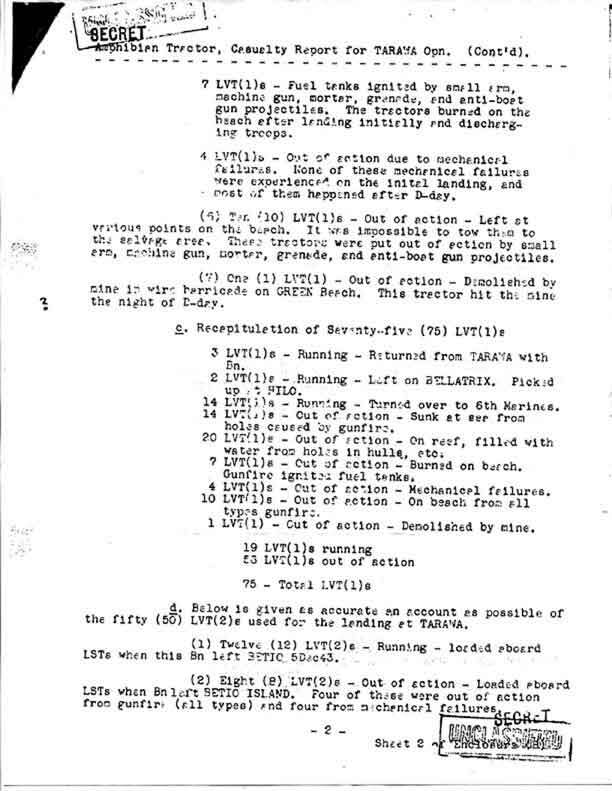 Or that an LVT(2) hit a mine, but not on 21 NOV 1943? Or that the dates were reversed and the LVT(1) hit a mine on D+1 (21 NOV 1943) and the LVT(2) hit the mine off Green Beach on D-Day (20 NOV 1943)? It is obvious that the writer intends to say "LVT-1" since he also calls it an "Alligator", while the LVT(2) is called a "Water Buffalo." CAPTAIN HENRY G. LAWRENCE, JR.